Get all the 70’s Men’s Hair Style Wigs for John Travolta, Ron Burgundy, Jim Morrison, any 70’s character, any 70’s movie, any 70’s TV show or Rock Star ever. You will find 70’s Afro Wigs, 70’s 70’s Giant Afro Wigs, 70’s Afro Wigs with Attached Side Burns, Long 70’s Shag Wigs, Short 70’s Shag Wigs, 70’s Rock Star Wigs, 70’s Long Hair Freak Wigs, 70’s Hippies Wigs and any Men’s 70’s Hair Style Wigs imaginable. There are 70’s Men’s Mustaches, 70’s Sideburns and 70’s Facial Hair and Spirit Gum. 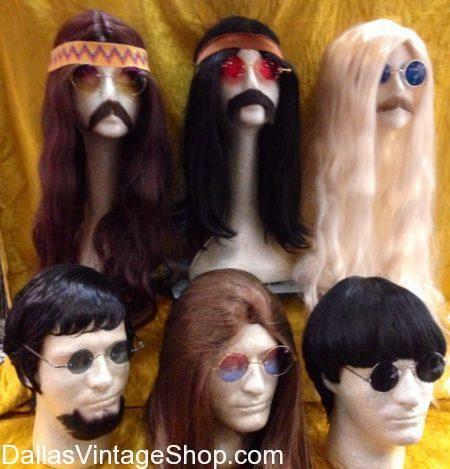 Nobody in the Dallas, DFW or North Texas area has more 70’s Wigs for Men than Dallas Vintage Shop. Don’t forget that we have the entire costumes for any and all of these 70’s Men’s Movie Characters, 70’s Rock Stars, 70’s TV Show Characters, 70’s Famous Sports Characters or any 70’s Historical or Theatrical Characters. Get Supreme Quality 70’s Wigs and Costumes or Economy and Median Priced Costumes.